Leslie Wallace Mayfield was born March 22, 1905, in Orion Twp., Richland Co., WI, and died December 27, 1981, in Ontario, Vernon Co., WI, at age 76. Buried in Readstown Cemetery, Readstown, Vernon Co., WI. He had colon cancer. He is the son of Cyrus Lorin Mayfield of Richland Co., WI, and Iva May Abbey of Aldine Twp., Norton Co., KS. Isolene Wilson was born March 25, 1909, in Eagle Twp., Richland Co., WI, and died September 12, 1973, in Lone Rock, Richland Co., WI, at age 64. Buried in Richland Center Cemetery, Richland Center, Richland Co., WI. She is the daughter of Alexander S. "Alex" Wilson of Tennessee and Elizabeth Naoma Fry of Wisconsin. Leslie Wallace Mayfield (age 21) and Isolene Wilson (age 17) were married February 19, 1927, in Wisconsin. Marie Mae Mayfield: Born 1929 on Ash Creek, Buena Vista Twp., Richland Co., WI; Died August 14, 1945, in a Madison hospital, Madison, Dane Co., WI (age 15). Buried in Richland Center Cemetery, Richland Center, Richland Co., WI. Never married. Kathryn Lucille Mayfield: Born July 10, 1930, on Ash Creek, Buena Vista Twp., Richland Co., WI; Died July 31, 1955, in Richland Co., WI (age 25). Married July 6, 1947, in Unknown to Robert Lester Hatcher: Born June 23, 1924, in Henrietta Twp., Richland Co., WI; Died March 9, 1968, in a hospital in Richland Co., WI (age 43). Leslie Wallace Mayfield and Isolene (Wilson) Mayfield divorced in 1934. Isolene (Wilson) Mayfield then married Adolph H. "Huck" Lebansky. Adolph H. "Huck" Lebansky was born June 22, 1909, in Yuba, Richland Co., WI, and died June 3, 1987, in Lone Rock, Richland Co., WI, at age 78. He is the son of Charles "Charley" Lebansky of Czechoslovakia and Rosa "Rose" Levy of Unknown. Adolph H. "Huck" Lebansky and Isolene (Wilson) Mayfield were married after 1934 in Wisconsin. Adolph H. "Huck" Lebansky and Isolene (Wilson) (Mayfield) Lebansky were divorced before 1975 in Wisconsin. Adolph H. "Huck" Lebansky then married Olive Rose (Crary) Squires. Delbert Hugh Squires was born July 16, 1903, in Richland Co., WI, and died June 21, 1962, in Lone Rock, Richland Co., WI, at age 58. Buried in Button Cemetery, Buena Vista Twp., Richland Co., WI. He is the son of Frank J. Squires and Susan Henry. Olive Rose Crary was born November 8, 1908, in Lime Ridge, WI, and died February 13, 1991, in Pine Valley Nursing Home, Lone Rock, Richland Co., WI, at age 82. Buried in Button Cemetery, Buena Vista Twp., Richland Co., WI. She is the daughter of Charles Henry Crary and Bessie Belle Phetteplace. Delbert Hugh Squires and Olive Rose Crary were married December 24, 1926. Delbert Hugh Squires and Olive Rose (Crary) Squires had several children. Adolph H. "Huck" Lebansky and Olive Rose (Crary) Squires were married January 30, 1975, in Richland Center, Richland Co., WI. Leslie Wallace Mayfield then married Vivian Arleen Lewis. Vivian Arleen Lewis was born October 21, 1925, in Kickapoo Twp., Vernon Co., WI, and died February 4, 1995, in Richland Center, Richland Co., WI, at age 69. Buried in Readstown Cemetery, Readstown, Vernon Co., WI. She is the daughter of George David Lewis of Union Twp., Vernon Co., WI, and Gracia Jane Clift of Forest, Richland Co., WI. Leslie Wallace Mayfield (age 45) and Vivian Arleen Lewis (age 24) were married March 31, 1950, at 6 p. m. at the home of the bride's parents, Mr. and Mrs. George Lewis, Oil City, Ontario, Vernon Co., WI. Leslie Wallace Mayfield and Vivian Arleen (Lewis) Mayfield had no children. Isolene (Wilson) (Mayfield) Lebansky is buried in Richland Center Cemetery, Richland Center, Richland Co., WI. Thanks to Find-A-Grave for making this image available. 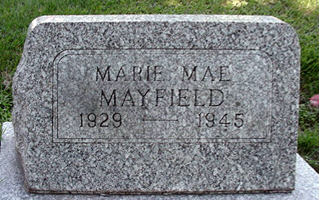 Marie Mae Mayfield is buried in Richland Center Cemetery, Richland Center, Richland Co., WI. Thanks to Find-A-Grave for making this image available. Delbert Hugh Squires was born July 16, 1903, in Richland Co., WI. Leslie Wallace Mayfield was born March 22, 1905, in Orion Twp., Richland Co., WI. The 1905 Wisconsin State Census taken on June 1, 1905, shows Cyrus L. Mayfield (age 28) born in Wisconsin to Wisconsin-born parents is a Farmer renting his farm and living in Orion Twp., Richland Co., WI. Living with him is his wife, Iva Mayfield (age 26) born in Kansas to Wisconsin-born parents. Also living there are his three children, all born in Wisconsin to Wisconsin and Kansas-born parents: Melva Mayfield (age 5); Lucile Mayfield (age 2); and son Leslie Mayfield (age 3/12). Olive Rose Crary was born November 8, 1908, in Lime Ridge, WI. Isolene Wilson was born March 25, 1909, in Eagle Twp., Richland Co., WI. Adolph H. "Huck" Lebansky was born June 22, 1909, in Yuba, Richland Co., WI. The 1910 U. S. Census taken on April 29, 1910, shows Aleck Wilson (age 37) born in Tennessee to Tennessee-born parents is a General Farm Laborer renting his home in Eagle Twp., Richland Co., WI. Living with him is his wife of 15 years, Naoma Wilson (age 32) born in Wisconsin to Tennessee-born parents, with 6 of the 7 children born to her still alive. Also living there are his six children, all born in Wisconsin to Tennessee and Wisconsin-born parents: Florence Wilson (age 12); son, Rossie Wilson (age 10); Elizabeth Wilson (age 8); Benjamin Wilson (age 5); Jacob Wilson (age 3); and Islee Wilson (age 1). The 1920 U. S. Census taken on January 13, 1920, shows Aleck Wilson (age 47) born in Tennessee to Tennessee-born parents is a General Farm Farmer renting his farm in Orion Twp., Richland Co., WI. Living with him is his wife, Naomi M. Wilson (age 41) born in Wisconsin to Tennessee-born parents. Also living there are his four unmarried children, all born in Wisconsin to Tennessee and Wisconsin-born parents: Elizabeth M. Wilson (age 17); Jacob H. Wilson (age 13); Islee M. Wilson (age 10); and Bessie A. Wilson (age 8). Vivian Arleen Lewis was born October 21, 1925, in Kickapoo Twp., Vernon Co., WI. The 1930 U. S. Census taken on April 22, 1930, shows Leslie Mayfield (age 25) born in Wisconsin to Wisconsin-born parents and first married at age 22 is a Farm Laborer renting his home for $5/month and living in Buena Vista Twp., Richland Co., WI. Living with him is his wife, Isolene Mayfield (age 21) born in Wisconsin to Wisconsin-born parents and first married at age 18. Also living there is his daughter: Marie Mayfield (age 1-7/12) born in Wisconsin to Wisconsin-born parents. The 1930 U. S. Census taken on April 24, 1930, shows George B. Lewis (age 28) born in Wisconsin to Wisconsin-born parents and first married at age 22 is a General Farm Farmer renting his farm and is living in Kickapoo Twp., Vernon Co., WI. Living with him is his wife, Gracia J. Lewis (age 24) born in Wisconsin to Wisconsin-born parents and first married at age 18. Also living there is his two daughters, both born in Wisconsin to Wisconsin-born parents: Vivian A. Lewis Mayfield (age 4-5/12); and Shirley M. Lewis (age 10/12). The 1940 U. S. Census taken on 1940, shows Leslie Mayfield (age 35) born in Wisconsin with 8 years of School and 5 years ago was living in the Same Place is a widowed Hired Hand Farm Laborer and is living in the Joseph Bodendine residence, Ithaca Twp., Richland Co., WI. The 1940 U. S. Census taken on May 7, 1940, shows Adolph Lebansky (age 30) born in Wisconsin with 8 years of School and 5 years ago was living in the Same Place is a Laborer at a Saw Mill and is renting his home for $5/month and is living in the Village of Yuba, Henrietta Twp., Richland Co., WI. Living with him is his wife, Icelene Lebansy (age 31) born in Wisconsin with 8 years of School and 5 years ago was living in the Same Place. Also living there are his two daughters, both born in Wisconsin 5 years ago were living in the Same Place: Marie Lebansky (age 11); and Katherine Lebansky (age 9). Marie Mae Mayfield died August 14, 1945, in a Madison hospital, Madison, Dane Co., WI, at age 15. RICHLAND CENTER - Marie Mae Mayfield, 15, died Tuesday in a Madison hospital. She had been ill five years. She was born on Ash Creek and spent her life in Richland county. She is survived by her parents, Mr. and Mrs. Leslie Mayfield, Ash Creek, and Mrs. Isolene Lebansku, Hub City; a sister, Kathryn, and her grandparents, Mr. and Mrs. Cyrus Mayfield, Dodgeville. Leslie and Vivian Arleen Lewis were married on March 31, 1950 at 6 p. m. at the home of the bride's parents, Mr. and Mrs. George Lewis, Oil City, Ontario, Wis. Special. The bride, a graduate of La Crosse STC, has been on the faculty of the Ontario grade school the past three years. They will reside on a farm near Yuba. Leigh Larson note: Oil City is in Monroe Co., WI, located just north of Ontario, Vernon Co., WI. ONTARIO - In a simple ceremony at the farm home of her parents, Miss Vivian Arleen Lewis, daughter of Mr. and Mrs. George Lewis, Ontario, became the bride of Leslie W. Mayfield, Yuba, son of Mr. and Mrs. Cyrus Mayfield, Dodgeville. Snapdragons decorated the living room in which the Rev. Lorne Outcalt read the 6 p. m. service on Friday. The bride wore a medium blue afternoon dress with a nailhead trim. Immediately following the ceremony a buffet supper was served. On Sunday afternoon a shower was given for Mr. and Mrs. Mayfield at the Ontario Knights of Pythias hall. The bride is a graduate of La Crosse State Teachers college and has been on the Ontario grade school faculty for three years. Mr. Mayfield has a farm near Yuba, where the couple will reside. The collision on Richland County Trunk I between Hub City and Cazenovia killed Gaylord Dignan, 27, Richland Center, driver of one car; his passenger, Francis Teach, 25, Richland Center; Mrs. Kathryn Hatcher, 35, Hub City, driver of the other car, and Murray Spencer, 15, Hub City, one of her passengers. RICHLAND CENTER - Mrs. Lena Hatcher, 69, was struck and killed Wednesday by an oil truck making a delivery on her farm near Yuba. Coroner Dayton Hinke of Richland County said Mrs. Hatcher apparently approached the truck on the driver's blind side as the truck was backing up. Hinke said the driver was backing slowly and was taking "all the necessary precautions." Delbert Hugh Squires died June 21, 1962, in Lone Rock, Richland Co., WI, at age 58. Buried in Button Cemetery, Buena Vista Twp., Richland Co., WI. 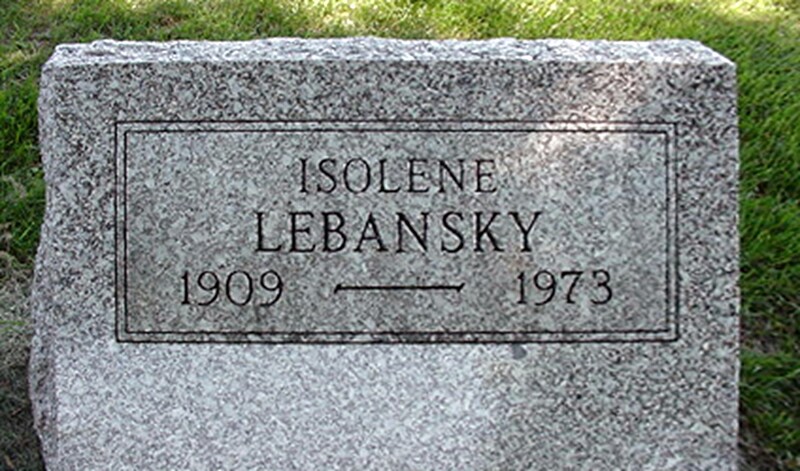 Isolene (Wilson) (Mayfield) Lebansky died September 12, 1973, in Lone Rock, Richland Co., WI, at age 64. Buried in Richland Center Cemetery, Richland Center, Richland Co., WI. RICHLAND CENTER - Mrs. Isolene Lebansky, 64, Lone Rock, died Wednesday at home. Surviving: two grandchildren; and one great-grandchild. Funeral, 10 a.m. Saturday. Pratt. Visitation after 4 p.m. Friday. Leslie Wallace Mayfield died December 27, 1981, in Ontario, Vernon Co., WI, at age 76. Buried in Readstown Cemetery, Readstown, Vernon Co., WI. Adolph H. "Huck" Lebansky died June 3, 1987, in Lone Rock, Richland Co., WI, at age 78. Olive Rose (Crary) (Squires) Lebansky died February 13, 1991, in Pine Valley Nursing Home, Lone Rock, Richland Co., WI, at age 82. Buried in Button Cemetery, Buena Vista Twp., Richland Co., WI. Vivian Arleen (Lewis) Mayfield died on February 4, 1995, in Richland Center, Richland Co., WI, at age 69. Buried in Readstown Cemetery, Readstown, Vernon Co., WI.